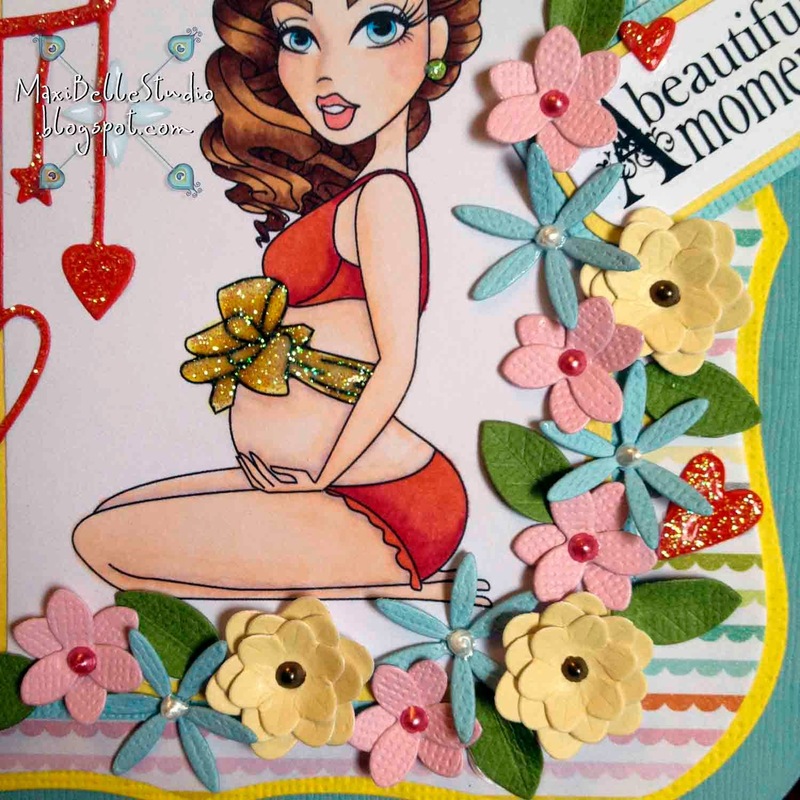 Today's inspirational card is a special gift for a wonderful friend who is expecting the greatest of gift of all! As she does not know what she is having, I've kept my colours neutral but nice and bright too. I've used the Spellbinders Grand Label One to create the base of the card. This is a wonderful nest of dies which are great to create cards that are not square or rectangular, but still giving you lots of room to work with. This blooming image is 'The Greatest Gift' from Sassy Studio Designs, and I've coloured her with my favorite medium, Copics! Here is a close up of this blossoming lady. After matting the image on a couple of coordinating colours, I simply added the Memory Box Precious Mobile with a cluster of flowers cut from the Impression Obsession Layered Floral Set. I've finished this card off with a splash of Kindyglitz & Liquid Pearls in the centres of the flowers. Here is a closer look at both the Mobile & the Flowers. If you haven't already taken part in our Challenge. The current 'One for the Boys/Father's Day' challenge wraps up on June 13th, but there will be a brand new challenge starting on June 15th! Thanks for stopping by. I hope I've left you inspired with this card. Oh, what a great card! Love that mobile! And your coloring is beautiful as always! Your friend will cherish this card, I know! WOW what a fabulous creation Alicia! Awesome coloring on the 'sassy' image and your design is just perfect! The new mom is going to be thrilled with your creativity! Well done ... wonderful inspiration! So cute! Love the mobile. Super design Alicia! Very cute and love your coloring!